If you look at Deities/Time, you'll see that the ribbon of the Ethereal, what Tanians call The River, is the interaction of the 3 Gates coming together with Set's anticipation of freedom to create Time. Time flows right through the Tehran Universe. At the end of Time is Oblivion, which is incorrectly referred to as a Gate until Cor'tanos, the shadow dragon, returns and informs Alerius that it is just 'the end.' The Shadow Dragons know that it is not a gate at all. Though not referred to as a Gate, Tehra does act as if one. The Gate of Warp is not an actual gate; it's an artificial construct that now acts as if a Gate. It cannot create, change, or destroy without touching the others. What is a Nexus? 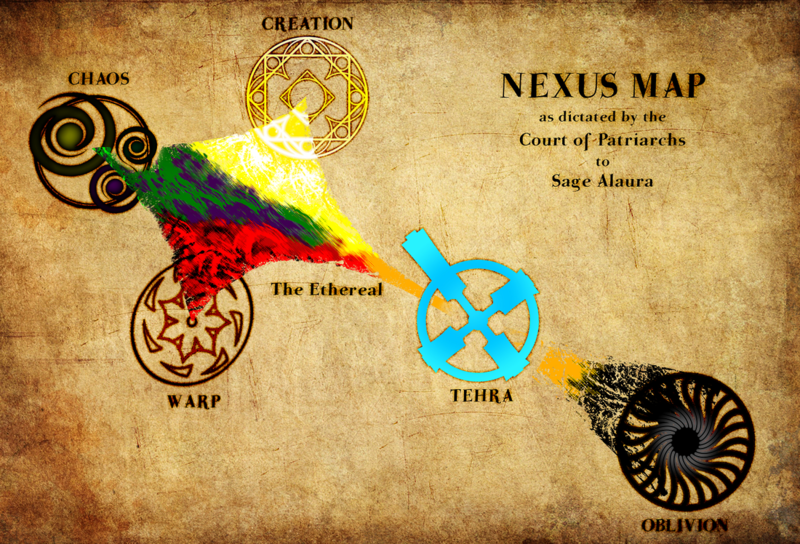 A nexus is a connector to another realm, specifically one of the 4 primal ones: Creation, Chaos, Warp, and Tehra. Though shown, Oblivion is not a nexus. It is where Time stops flowing and all matter and intelligence becomes inert. It's very gradual, until a creature can barely move. Lacking will, they exist as only intelligence and resignation until they revert back into pure matter and recycle through the Gates. The word Nexus and Gate can be used interchangeably, but refer to the same thing: Stepping from one universe to another. This is different than a summoning gate a sorcerer would use to bring forth an allied monster. Nexus matters when traveling the multiverse. Let's say that there is a Tanian mage named Stephen and a Tanian cleric. He has 10 points of power. The cleric has 100 points. He wants to go to the Abyss. He must make 3 steps. 5. 555 to 444; is Lolth. Not a good place to be unless you're on good terms with Lolth. Phase spider food. In the 1st step, unless Stephen has been blessed or assisted with this step, he is reduced in power by 10, to 1. The cleric took them there by Tiamat's power. They're both still at 10 and 100. In going to the Astral, Stephen uses magic and so they retain their 10 and 100 power rating. Most sentient beings can figure out how to access the Astral without diminishing. However, when they cross from the Astral to Chaos, they diminish to 1 and 10. While their intelligence, will, and knowledge remain what they were, their magical gear, their bodies, their ability to cast spells, are decreased. All created beings retain a "power level" of 1 minimum for multiversal travel, in this 10 point example. Subsequent next steps register as an increase in gravity and lethargy. When they reach the 333rd, they are essentially 1,000,000x weaker than in their own dominion. Shortcuts become important as does survivability. The use of avatars, bodies inhabitable and created in the Astral, Temples, and being "pulled" to the destination rather than going step by step, are some of the ways these can be bypassed. When a god visits Tehra, unless they are a nexus god, the reduction in power makes it so that they most often send avatars or servants. It is easier to send a message than a messenger. This is why worship, prayers, scrying, and the like are so important. It also explains why some gods are more active in Tehra than others. Compared to a Tehran mortal, a god has infinite power in their own dominion. Even if Stephen could show up as a 10 point mage, the god and its creatures on its own throneplane are exactly as strong as the god wants them to be. Moreover, because Stephen has joined that throneplane, Stephen is as a strong or weak as the god wants him to be. This is where the concepts of omniscience and omnipotence come from; these concepts apply to a god on its own throneplane. Pha Rann arose as the first intelligence. While sages divide opinion about what would have happened if the First had been something other than a benign creator, Pha Rann is the reality. Pha Rann decided to share the Gate of Creation with other eldar who reveled in the glory of well-executed design and creation. Beauty, function, form, and uplifting purpose define all of Pha Rann's creations... which include the Tehran Universe. Though other eldar claimed their own dominions, to access the Gate of Creation, they all agreed to share in Pha Rann's might. In other words, a "good" god has total access to the Nexus of Creation and there are no nexal steps from a "good" dominion to another. The gods are exactly as strong as their will and dominion supports them, and they can call upon aid from the other gods when needed. It is said that there are Seven Heavens. There is only a single, perfect heaven. In it dwell the various gods willing to share their power and use Creation according to the uplifting principles Pha Rann put forth. While beautiful and well-ordered creation is cherished by Pha Rann, the Creator set forth rules by which Creation's creations could reproduce and multiply, and fill the universe with their children. These rules, we'd call them genetics today, introduce the possibility of mutation and the rise of new unplanned-for creations. Just like in our world today, mutation is nearly always fatal; this is Gorgos. Just like in our world today, adaptation and reinforcement of genetically expressed traits can create specialized groups; this is Demos. When either of these "powers" are given a nudge, you get Demos-Gorgos who is not just obsessed but fascinated with it. When acting together, Demos-Gorgos can create as can other denizens of the Abyss. However, they lack focus and revel in the unexpected. They are just as likely to create something in an epiphany and then forget to finish it as to actually complete a creation. Towards the Gate of Warp, this tendency is more destructive. In the Time Before Time of the Eldar, Demos and Gorgos warred with each other for control of this power. Though stronger, Gorgos lost. Destruction is only possible when creation precedes it. Though Gorgos thrashed Demos, they both realized that the union of these powers meant they could both control it. It was a tenuous and fragile alliance. However, in their linear existence, they encountered Set. Set wanted to be like Pha Rann... wanted to be the Gate of Chaos and sought to consume it and control all of its power. First singly, and then later in alliance, Demos-Gorgos joined together and battled Set. When Creation saw the nature of this battle, Pha Rann allied with Demos-Gorgos to preserve the Gate of Chaos from being singly controlled by a being such as a Set. It is said that there are 666 levels of the Abyss. This is incorrect. There are as many layers to the Abyss as Demos-Gorgos feel are required to keep Set at bay and safely locked in sleep. The Abyss is therefore infinite. The Sage Alaura clarified this to mean, "When it is said there are 666 planes, what the speaker means is that it's an imperfect infinity." Other eldar coveted the Creation-power and found that, while they could create, there was no permanence to their creations. Once manifest, unless they continued to focus their will on it, they faded away into the fits and stuttering of Time. One of the many, Asmodeus, studied and watched. He theorized that if he could just borrow a bit from Creation and another bit from Chaos... and then it happened. The union of Demos-Gorgos and then Pha Rann's aid against Set. Asmodeus called those like him together and said, "Behold, the Gate of Warp!" and they believed him, the strongest of their kind. They watched as Asmodeus rose up and joined the battle against Set, and their belief strengthened when they saw Pha Rann and Demos-Gorgos accept his aid. This belief that they could have a Gate of Warp became a likeness of what would later be Tehran worship. The belief amalgamated as lent-will to Asmodeus. Together, all of it, allowed Asmodeus to create a semblance of a Gate. To avoid being found out, Asmodeus organized the Gate of Warp into layers and put himself and the Gate high above the others of his kind. These became the Hells. Though it is said that there are 9 Hells, it would be better to say, "Asmodeus knows exactly how many there are. You could travel them. They are finite." Warp matters though because it holds the Hells together and is the connector to the Astral for Warp. Unlike the other gates, Warp cannot create. It can only capture and twist. The Tehran Gate is the mixing of the other 3. The Tehran Universe is what was left after the 3 Gates separated away from the ribbon flowing Time that would otherwise end the eldar with aging. The unique mix of energy from the Gates, lineage of the fallen eldar, and the flow of Time create "magic" in the Tehran universe. It also creates sentient life INDEPENDENT of the gods. In all other realms, sentience only exists by divine decree. However, it spontaneously arises in Tehra. Additionally, Tehra is the only universe where mortals can become powerful enough to ascend and become gods. Consecration is the micro-principle of Ascension. Not all mortals will ascend, but the potential of their Ascension is the divine power their life's actions channel to the god they consciously or unconsciously worship. This makes Tehra unique and highly coveted. Once a god gains worshipers from Tehra, like an addictive drug, the god will ensure worship continues... and this is why clerics have the power they do. The god wants to answer their prayers and show their power. It preserves the worshipers they have and opens the possibility of more worshippers joining them. There are two kinds of sub-nexal gates: adjacent and designed. Realms adjacent to a Nexus are sub-nexal as a function of how the multiverse works. That is, they are coincidentally 1 step removed from a Nexus. The Astral is The Sub-Nexus for Creation, Chaos, Warp, and Tehra; it bears them all. By design, there are additional sub-nexus gates too but they proliferate in the Abyss as the eldar there have sought shortcuts to access the Astral. Demos reigns alone over the lower Abyssal realms and they are quite benign places where mutation and evolution are worshiped and revered. Humans there might have a tentacled 6th thumb, or you might find the X-Men mutants masquerading as normal people in a realm very-well called Genosha. Multiversal travel is expensive and difficult to do. There are inherent dangers in crossing the Nexus of any realm. Unless shortcuts come into play, traveling more than 4 steps makes the traveller so weak as to be lethal. In Stephen's example with the Darkhold, he'd be so weak that a paper cut could kill him. This is why you don't see the angels of Heaven launching full scale assaults into Hell and vice versa. Astral to the 9th or 1st, 2 steps... you're going to either end up attacking the strongest gods in their omnipotent throneplanes and you're 100x weaker, or having to cross to say, Geryon's realm in the 6th, another 3 steps and another 1000x diminishing. The prospect of a Tehran doing the same thing, or a god coming to Tehra to personally intervene just does not make sense. Going from omnipotence to limited power is uncomfortable and the possibility of aging, of dying, are not just frightening but terrifying to the ageless. Not that the gods are "scared." Gates - If a creature is pulled via gate, the interloper arrives at half the step reduction. This is why mages can summon extraplanar beings able to fight. On their throneplanes, the summoned creatures would never be defeated. Gold - Gold is the only metal that retains its enchantments across the realms. That is a gold sword suffers a reduction in metal strength, but the magic it holds remains at whatever equivalence it had when enchanted. Shift - Shift is a type of magic whereby, through careful artificing, like Bomoki's Gate, the actual gate functions as a different nexal boundary. Using Bomoki's Gate as an example, the user is able to place it adjacent to a known nexus and is treated as a single step. In this manner, a Tehran like Bomoki could arrive at Orcus' sub-nexal realm on the 665th at a 10x reduction rather than 1000x reduction (Tehra to Astral, Astral to Chaos, Chaos to 665). Temples - Temples act like a bridge to a god's dominion, bringing them half a step closer to the god. So, a god that is 3 steps removed is able to manifest power to his worshipers as if only 2.5 steps removed. The power differential is tremendous and palpable. This is why Temples feel sanctified even if the visitor does not worship that god. There is a weightiness to them because they are not entirely of this world. Avatars - Avatars are born or created in the Astral by a god for the purpose of interacting in other realms. Angels do not come from Heaven, if rarely. For the most part, angels come from the Astral because the Gods of Heaven created them in the Astral for the sole purpose of Tehran intervention. Anchors - Anchoring is when a creature in one realm is so assured of death in another that they lock their soul back on their own plane and send only their awareness to the other realm. In the mage Stephen and Darkhold example, Stephen could go all that way in hopes of asking his question, or he displaces the soul of another creature and sends that, anchoring his own soul back in Tehra. This is how most divine visitations go. The actual god is anchored in their own throneplane while their awareness travels to Tehra or wherever in some other form. You see this in my writing where Seline acted as if Tiamat at the end of Bomoki's Gate, as well as in the discussion about whether the "real" Jade God would come through the gate or not. Set's Dream, in its discussion of the Slaadi, discussing this as a form of parasitic infection that can turn into a slaad bound to the new world. The Darkhold does this by casting its pages adrift in the multiverse... and so on. Paladins - A divine fighter, for the gods who chose to uplift such, is a shortcut. Though their physical attributes might diminish to the point they could be killed by a papercut, their divine powers do not. Paladins are how gods raise up avatars on other planes.